Ann Arbor as a citizenry and as a civic body has always considered that we are naturally environmental leaders. We got there early on recycling, planted lots of trees, preserved lots of natural areas with distinct plant communities, and (if not always perfectly) addressed issues of water pollution, stormwater management and general responsible behavior on environmental issues. We have supplied a major voter base for countywide or regional park and land preservation millages (kill sprawl!) and transit ballots. Now we are faced, as is the nation and the world, with a desperate situation well beyond any simple local fixes. Climate change is becoming more and more evident as a serious threat to a comfortable existence or even to life itself. This dramatic conclusion is based in part on a recent report by the Intergovernmental Panel on Climate Change which has been much quoted lately. There have been numerous studies about the phenomenon and its effects. So many of them have dealt with loss of species globally (The Sixth Extinction by Elizabeth Kolbert is a good start). But this not very digestible study is actually acknowledged to be a conservative consensus statement, yet it lays it right out there. Climate-related risks to health, livelihoods, food security, water supply, human security, and economic growth are projected to increase with global warming of 1.5°C and increase further with 2°C. That means an average global temperature increase of 1.5° degrees C (about 2.7° degrees F). And when are we projected to reach that? Sooner than we want to hear about. 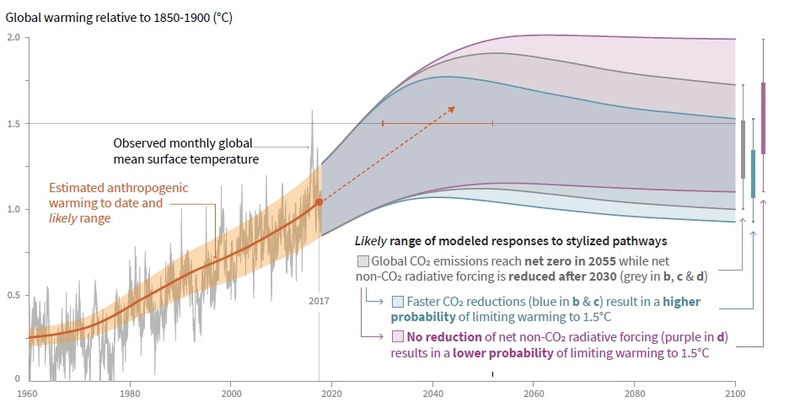 From the IPCC SR1.5 report, October 2018. This graph appears to indicate that the average temperature will increase to that 1.5° C amount in 2040. But note: there is a range indicated along that curve and the world average could move to the top of the range. See that spike in a recent year? That could mean that we arrive at a higher average earlier. And an important timing note: Avoiding overshoot and reliance on future large-scale deployment of carbon dioxide removal (CDR) can only be achieved if global CO2 emissions start to decline well before 2030. So in other words, in 12 years from now, we’ll need extreme or possibly technological unavailable methods to retard warming if we haven’t already achieved that.The report adopts a somewhat optimistic tone that proposes a combination of carbon dioxide removal and major adaptive technology and policy changes. (Note that warming is not solely due to carbon dioxide; there are other greenhouse gases and physical effects such as change in albedo because of deforestration and ice melting. That is the “non-CO2 radiative forcing” part of the model.) But it is hard to share those hopes given today’s world, including our own national government and its pro-coal stance. Section D-5 implies a considerable “Kumbaya moment” on the part of the international community. The systems transitions consistent with adapting to and limiting global warming to 1.5°C include the widespread adoption of new and possibly disruptive technologies and practices and enhanced climate-driven innovation. These imply enhanced technological innovation capabilities, including in industry and finance. In other words, the nations and institutions of the world will really have to cooperate and give up a considerable amount of autonomy to prevent the predicted outcome. There is no shortage of glum reports and predictive models out there. Numerous scientific papers have explored the effects of current and predicted climate changes on many social, biological and physical systems. Just the day after Thanksgiving (November 23, 2018) the Fourth National Climate Assessment was released. We will not review that here. Needless to say, little good news. And earlier this year an august group of scientists published a report in the Proceedings of the National Academy of Sciences (USA) that warns of a possible tipping point in which Earth systems could be thrown completely off kilter, into a condition they call “Hothouse Earth”. …we argue that social and technological trends and decisions occurring over the next decade or two could significantly influence the trajectory of the Earth System for tens to hundreds of thousands of years and potentially lead to conditions that resemble planetary states that were last seen several millions of years ago, conditions that would be inhospitable to current human societies and to many other contemporary species. What’s A City to Do? All this has not gone unnoticed in Ann Arbor. The City passed a Climate Action Plan (mostly just CO2 reduction) in 2012. Unfortunately, those goals were not met and there have been some revisions. Last year the Council announced that it would use part of the County mental health millage “rebate” for climate change action. Most of what was proposed in early memos was basically going to electrical solutions (which are possibly getting more climate-friendly, though there are still many coal power plants) and trying to switch as many functions to solar as possible. More recently a newly expanded City department of Sustainability and Innovations proposed a multi-faceted approach, much of which was also focused on solar and electric power, plus a dose of energy conservation. The proposal became snarled in its funding source, which was controversial (the lamented Mental Health Millage rebate). Another point of contention has been the rapid expansion of the Sustainability and Innovation Office. The office has grown from one person (Matt Naud, the longtime coordinator for the Environmental Council) to four or five (one position is vacant). The original proposal called for an increase in the budget for that office, which it was understood would be used for salary supplements for the new staff. After a failure of the original resolution and some amendments, the result was funding for some particular projects but the money came from the General Fund, leaving the question of use of the millage open till another day. The extra money to the department did not make it through the cuts. Urban resilience refers to the ability of an urban system-and all its constituent socio-ecological and socio-technical networks across temporal and spatial scales–to maintain or rapidly return to desired functions in the face of a disturbance, to adapt to change, and to quickly transform systems that limit current or future adaptive capacity. One very important word there: adapt. This highlights the more recent trend in discussion of climate change effects. Basically, many people in this field now acknowledge that we probably aren’t going to make it. That is, we will not succeed as a world in reducing CO2 to the recommended levels. So the emphasis in recent years, as seen in the literature, is adaptation. How can we live in a changed world that is suffering the effects of climate change? This is something on which we can hope for leadership from Stults and her crew, since she has written extensively on adaptation as well as resilience. What Ann Arbor has done mostly up to now, as displayed on the Sustainability page, has been to offer a miscellany of environmentally good practices, all nice but not solving the local problem. (As an extreme example, last year a local nonprofit was given a grant to put stickers on compostable containers. I didn’t see them but I assume it was a guide to proper materials.) I will continue to recycle and take toxics to the County until the end of my days, but that won’t solve the likely effects of climate change on our community. Doing an occasional NetZero demonstration project, buying an electric car for the City fleet, and putting a few solar panels on City buildings will not help us adapt, and sadly will not do much about the world’s problem either, since the infinitesimal fraction of CO2 that these will save is almost pointless (if admirable) in the face of Poland and Germany relying on coal power and the President of the United States lifting regulations on coal plants. …this acceleration, which took off in 2002, was not a short-term phenomenon but continues since more than a decade. Between 2002 and 2015, global material extraction increased by 53% in spite of the 2008 economic crisis…We find that in such a scenario until 2050 average global metabolic rates double...(indicating) a grand challenge calling for urgent action, fostering a continuous and considerable reduction of material flows to acceptable levels. So while at the same time we’ve been patting ourselves on the back and rebranding traditional environmentalism as “sustainability” or even “climate change mitigation”, our policies have been literally driving up the temperature. We have a new Council now with some thoughtful additions. But it will be up to all of us to figure out the adaptation strategies that can work for our community in an equitable and reasonably comfortable manner. It is quite a challenge. Note: The date shown for this post is confusingly November, 2018. However, it was actually posted on January 1, 2019. I mistakenly “published” my first draft in November and was able to take it back to draft status only after it had already attracted a comment. Actual publication was delayed until January 1. This entry was posted on November 23, 2018 at 6:02 pm and is filed under Sustainability. You can subscribe via RSS 2.0 feed to this post's comments. You can comment below, or link to this permanent URL from your own site. Thank you for your detailed and thoughtful post, as always. Of course, action must be taken nationally and internationally, but this is also a local issue. With your introductory paragraph are you implying that Ann Arbor is already doing enough to stem climate change? And are there implications for how Ann Arbor should be spending the recent millage funds, part of which the (previous) city council earmarked for energy conservation? No, I’m not implying that we are doing enough to stem climate change. I’m questioning the approaches and assumptions. I hope that is more clear (your comment was posted before I finished the post). A question I didn’t address in the post is the use of resources. If we are to adapt, should we be spending our limited resources on scattershot attempts to cut a little here and there? I hope our leaders can answer that. Glad to see you haven’t yet thrown in the towel. Talking about what’s coming is like breaking the fourth wall in movies- you’re basically admitting it’s a movie. Suspended disbelief no longer required. People just do not accept that their lives are going to change in radical ways. Interesting and detailed post. I’m curious about the section near the end pointing out the perceived tension between development and reducing our carbon footprint. While I have no doubt that the entire process of constructing a building has environmental costs I had understood that denser living situations are better long-term for the environment than suburban sprawl (less heating/cooling, shorter commuters, less landscaping etc.). If the folks living in the new developments would otherwise just live in an existing building or house within walking distance of their jobs then perhaps the new building is a net loss — but if they otherwise would live in homes on mult-acre lots 20-30 minutes outside of town I think it’s more complicated. Thanks – you are correct in reflecting the usual equation of “where is growth going to happen” and assuming a continued increase in population. But I’m actually after a different perspective, one in which we stop emphasizing growth and start to consider how our community will adapt to climate change and its effects. The whole concept of “resilience” implies this. It’s complicated. There are many long documents with pages of detail so I’ll just hit a couple of highlights. First, dense urban growth actually creates less resilience. Urban heat islands are a problem, as is air circulation. If we assume that our local mean temperatures, especially extreme summertime temperatures, increase, then we have made life harder for those inhabiting the dense area. In addition, the high dense buildings have a higher demand for concentrated infrastructure such as electrical and water utilities. Imagine being stuck on the 8th floor of a building during a power outage and heat wave. Will these buildings have generators? Those are energy consumers and heat generators. You mention landscaping, evidently as a “bad”. But part of climate adaptation is to increase the amount of plant growth, whether as urban trees, open spaces, etc. These have a cooling effect and also provide psychological support. There are equity implications to slowing down growth. Just one of the many thought problems needed to be worked out. But I was trying to change the paradigm. It is a refocus. I’m trying to say that we should use our limited local resources and address our policies to the future livability of our community. Instead, we are using a very few “sustainability” approaches to justify rapid growth and economic return, a trend that has been accelerating here and worldwide in this century. So it is all about the pestilence of CO2, the newest plague killing the planet. Glad we found the enemy. All we have to do now is to kill CO2 completely and enjoy the world without it. Got it. Hello, Andrew, I read your comments on Nextdoor and understand you are a skeptic. The nearly, but not quite universal consensus is that increases in CO2 are causing the warming. There are other factors. Loss of tree cover, for example, so that radiative heating is a factor. Desertification has similarly had an effect on the albedo. Our industrial farming complex has created a huge methane source, also a GHG. It is a complex issue and many factors are interrelated. If you look at the history of the Earth on a geological time scale, you’d know that many times the atmosphere has undergone extensive, or from the viewpoint of the current occupants, catastrophic, changes. One can understand this but be reluctant to participate in such an event.